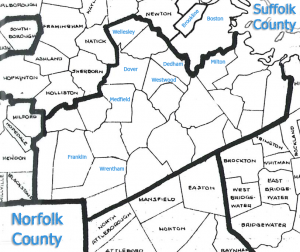 Norfolk County is known as the County of Presidents because it is the birthplace of four Presidents of the United States: John Adams, John Quincy Adams, John F. Kennedy, and George Herbert Walker Bush. Norfolk County consists of twenty-eight (28) eastern Massachusetts communities, mostly located to the South and West of Boston. There are 35 water systems supplying the towns in Norfolk County. Dedham/Westwood to the North, Wellesley Water Department (Wellesley College has its own supply), Dover Water Company Vnd, Holbrook Public Works and thirty others. The largest supplier is the Weymouth Water Department (over 52,000 people) and smallest is Old Farm Road Water Trust in Dover servicing approximately 35 people. Most of the homes are serviced by the above mentioned water suppliers, however, there are some private wells that supply homes in the county. The typical filtration work implemented in these wells is for the removal of iron, removal of manganese, and the neutralization of low pH. Water softeners and other water filtration systems, including sediment and carbon filtration and reverse osmosis systems are recommended for the various water contaminants.